Restaurant “1221” is located in the very centre of the historical part of Riga. Just near the Dome Cathedral in the Old Town. On the roof of the restaurant a terrace with magnificent view over the Old Town can be found. The aura of 300 year old building can be felt here, as well as the oasis of calmness right in the centre of the city. “1221” is a high-end restaurant with exclusive European cuisine and great wine collection. None of restaurant’s guests will remain indifferent towards the master chef’s skills Robert Smilga. AQUA LUNA restaurant, bar and lounge is located in Andrejsala on the right bank of the Daugava River - still in the city centre, yet far from the hustle and bustle of downtown. Excellent menu and elegant interior design make it the right place to have a nice dinner, have a meeting, establish new business contacts, or simply have fun in a company of good friends. International influences can be found in the AQUA LUNA kitchen – French and Italian classics, Baltic traditional cuisine, Chilean perch, Indian mango, and originally served seafood. Fresh products, light and balanced food are the main rules for this cosy restaurant. The menu focuses on modern European cuisine with Asian accents, using classic cooking techniques and the latest culinary art. The restaurant’s menu was compiled in cooperation with Belgian chef Kenny Bernaerts, who has worked in many Michelin-starred restaurants across Europe, participated in the world famous TV show MasterChef, and now does consulting for the restaurant business worldwide, and is preparing his own concept restaurant in New York. The restaurant is a recipient of the "Best Design Award 2013". In the summer, there is a terrace at the restaurant which features a magnificent view of the Daugava, the yacht club, ferries anchored at the Riga Passenger Port, the rooftops and spikes of the Old Town, the Vanšu Bridge and the modern office buildings along the river. In the autumn and winter, "Aqua Luna" becomes warm and cosy, offering visitors the opportunity to sit by the fireplace and watch the flames sparkle. Art Hotel Laine restaurant`s interior in olive-green colouring, antiquated furniture and accessories retrace Riga of the far thirties. Restaurant offers a wide range of continental cuisine and fine wines, including traditional Latvian cuisine and vegetarian meals. The cosy Art Hotel Laine restaurant is nice during the winter, when you can view in flames of fireplace, and during the summer, when you can enjoy exquisite meal with wide assortment of grilled foods on the summer terrace, which we open as soon as spring comes. • 3.25 Ls – three-course meali: soup, main course and dessert. Campaign, happy hour: Complex lunch 3.00 Ls! Restaurant ASADO offers to our guests 2 halls, including smoking hall where big plasma screen with sport TV is located. Our kitchen is traditional European. We have car parking lot, free of charge for our clients. We serve banquets, children events, and rent halls for celebrations. You may also ask for different kinds of cakes on request. The ASTOR restaurant – is an elegant restaurant in a historic building in the exclusive part of Riga’s old town, with a view to the city park „Bastejkalns” where you will find the city canal, the Freedom Monument and the National Opera. The chief offers a wide selection of dishes, made from products of highest quality. Through the large windows down to the floor, you have the opportunity to enjoy the special atmosphere of the city right from your table. Its interior is modern, with Hi-Tech style elements and bright colors, the rooms - spacious and light, and the atmosphere – free and relaxed. AVALON is suitable for business breakfast and lunch and a romantic dinner. In summer guests are welcome to the restaurant at the roof terrace, which overlooks the beautiful Old Town houses and red tile roofs. Restaurant AVALON offers European fusion cuisine and it`s visit will be a pleasant journey in the world of tastes. Chef skillfully and creatively forms taste bouquets from different dishes, which will pleasantly surprise even the biggest gourmets. In addition, AVALON is an active member and partner of the movement "Free from GMO" ("Free from genetically modified foods"), Chefs Club, Live Riga and participates in various events and activities, where Latvian products, food culture and latest trends are promoted. Campaign, happy hour: Happy cocktail hour – take 2 cocktails for one price – every workingday from 16:00–19:00! Monthly cocktail – 2 for 1 price! (3 persons – 10% discount; 4 persons – 20% discount; 5 persons – 30% discount)! On holidays and Sundays families with children – 20% discount! B-bar restaurant was opened in 2004 in the heart of the historical centre of Riga near the Dome Cathedral. If you enter inside and take a seat at the window, you will be charmed by the ancient stone walls, which seem to be so near that you can stretch your hand and touch them. However it is not the only attraction of the bar. The bar has got the attention and interest of our customers since its opening day, thanks to the original interior design, merging styles of today and the beginning of the 20th century, as well as the exquisite selection of cocktails and dishes. Popularity and sincere recognition of the customers have also been given to the live music evening parties and theme events held in the B-bar restaurant. The creative and metropolitan atmosphere, which reigns in the bar, attracts the gilded youth of Riga, popular actors and musicians, as well as everyone, who enjoys spending their leisure time in a really attractive and interesting ambience. We have also made sure that our very young visitors would not get bored. For the entertainment of children we have equipped a special play room, where they can stay and play while the old folks finish their drinks. In the hot summer days, the B-bar restaurant diners prefer to sit outside on the terrace, where the ancient glow of the nearby Dome Cathedral let them feel the charming mood of our old city. Baltvilla restaurant is located in uptown Riga at the picturesque Beach of Baltezers Lake. The excellent team of restaurant Baltvilla is so competent that we can state that you don’t need to have Michelin stars to enjoy delicious food. Just come to Baltvilla! The restaurant is always down the road for those who want to enjoy Latvian aromas, tastes and relax just 5 minutes away from the city, here in Baltezers. The most beautiful and ever changing part of our restaurant's interior is a picturesque view on the Baltezers Lake having exciting and fabulous sunsets in the summertime and incredible landscape in the wintertime. The interior of our restaurant is cheerful and made in vibrant colours that makes a beautiful contrast with white tablecloths and bright paintings. Baltvilla restaurant A La Carte menu is seasonal. Because of the fact that we are located next to the lake and forest, summer and winter seasonal menus are based on the local nature gifts. You definitely will be inspired by the portion sizes. Seasonal menus will please those people who want to enjoy a three-course meal at acceptable price. The restaurant Benjamins is located in a house that was built in 19th century and has retained its aristocratic richness and magnitude. The restaurant is a unique leisure place in inimitable interior with high-class service and highest quality food. Ancient elements of interior have retained in four luxurious halls –crystal chandeliers from Murano glass, an exclusive and the biggest in Baltic states, fireplaces, ceilings, decorated in Italian Renaissance style and historical stained glass.All this endues the restaurant with an exceptional luxury and creates warm, unique and harmonious atmosphere. Special menu, prepared by chief, includes meal of classic European and Latvian dishes, and contributes to pleasant leisure. Each guest is welcomed here and is granted a possibility to feel the breath of history and to indulge himself with great time, spent in beautiful and historical building. 3. hall - FIREPLACE hall, 54m2. Seasons offer – local farmers' organic products! Gourmet dinner with especially smite wine selection! Bergs Restaurant, led by chef Oskars Cimdars, is located in the tranquil, elegant Bergs Bazaar courtyard and offers an enjoyable dining experience in a friendly, urban atmosphere already since 2003. The contemporary interior masterfully combines the new and the old, and an array of eclectic, historical façades surrounds the restaurant’s outdoor terrace. The menu at Bergs Restaurant excels in the art of simplicity, resulting in uncomplicated and unpretentious dishes accenting the natural flavors of the ingredients. Respecting the diversity of foods provided by the four distinct seasons in nature in the Baltic region, the menu particularly highlights local produce. Interior design of the restaurant Best fully resembles the modern style. Favourable service, wide range of European and Mediterranean food for reasonable price, as well as wide choice of beverages and alcoholic drinks – that's the business profile of the hotel Best. It is especially nice to spend warm summer evening on the terrace of our restaurant. Why look for anything else, when you already have the Best! business lunch in restaurant Bestsellers – 10 th lunch you will get free! Special 3 course weekday Business lunch: 4.50 Ls! Offers excellent service and dining in a cosy, intimate atmosphere. The Albert Hotel restaurant offers a wide variety of delicious cuisine, all freshly prepared with the best quality ingredients. Executive Chef Vitalijs Bokovojs presents the best of international dining at The Albert. Savour the best of Italian, French, Greek, Russian and Chinese cuisine. Try our delicious national Latvian specials. Our head chef Maris Jansons has created a unique modern library of Latvian cuisine, where the most high-quality seasonal ingredients are used, and where rich experience is combined with fresh inspiration. On the one hand, well-known classical dishes are king here, while on the other endless fantasy reigns in a search for new tastes and sensations which turn any lunch or dinner into an unforgettable journey. Bibliotēka №1Restorāns combines nature with roomy space, exquisite food with a great jump into the heavens, and the classics with bold creativity. This is a journey both through Latvian cuisine and through a totally new world. Lunch offer "guaranteed in 20 minutes" 12:00–15:00 in working days! Every Friday Corso Como – definitely the best entertainment after work! Come and enjoy free snack and drinks for special price from 17:30 at bar! Restaurant C.U.T. reflects the modern lifestyle and offers an informal dining experience. At restaurant the Chef will invite you on a gourmet journey introducing regional specialties among a wide range of grilled dishes. During the warmer month guests can enjoy eating and drinking Al Fresco on the beautiful presented sheltered Courtyard Terrace. Bar at C.U.T. with it’s beautiful view to Vērmanes park is an ideal place to relax in a trendy and urban atmosphere. Bar offers a large selection of spirits, long drinks and cocktails, plus some tasty snacks to indulge in. Campaign, happy hour: Business lunch from 12:00–17:00! These are a few words to remember while visiting Riga. Čarlstons restaurant has been successfully operating since 1999 and has become one of the biggest and most famous restaurants in Riga. Čarlstons is also renowned for its quality service, great food and catering team. other offers "uniting the team activities"
Katru darba dienu Business Lunch no 12:00–16:00, 3,90 Ls! Katru svētdienu bērnu izklaides pasākums no 12:00–17:00! Kosmopolītiskais restorāns Ciro’s Pomodoro pārsteigs Jūs ar izmeklētām garšas niansēm, lielisku atmosfēru un dzīvo mūziku. Divām slavenām ģimenēm Orsini un Kopola apvienojoties, tika izveidots uzņēmums, kurš jau vairāk kā 30 gadu ir izcilo Itālijas ēdienu, netveramo sajūtu un neizmērojamās enerģijas simbioze. Restorāns Rīgā ir tikpat pārdomāts un neatpaliek kvalitātē no Ciro’s Pomodoro Londonā, Abu Dabi vai Losandželosā. Ikviens apmeklētājs ir uzmanības centrā – gan pasaules slavenības, gan ģimene ar bērniem vai jautra draugu kompānija. Ciro’s Pomodoro devīze ir "Gaidi negaidīto". Restorāna virtuve strādā līdz pat pulksten 1:00 naktī. Mūsu telpas ir spējīgas uzņemt vienlaikus 150–200 cilvēkus. Cenu diapazons patīkami pārsteigs ikvienu. Pat tad, ja jūsu rīcībā ir tikai 10 Ls, jūs nejutīsieties vīlies. banketu apkalpošana (max cilvēku skaits) Līdz 50 pers. Welcome to our Columbine restaurant, which always has been the highest level of ambitions in food creations and service. We promise, your visit to our Columbine restaurant will be a journey in taste and service. Columbine restaurant offers meals from simplest food to cross-cooking and classic meals from European and Scandinavian cuisine. Flexibility is an evident part of our service. Our chefs are masters-promoters of various culinary traditions and cuisines. The Bar and Columbine restaurant are very much favored by business people. It has become a popular place to meet where one can relax and to enjoy a cold beer or a good meal. This Restaurant is suitable for private dinners, special events for up to 35 persons. 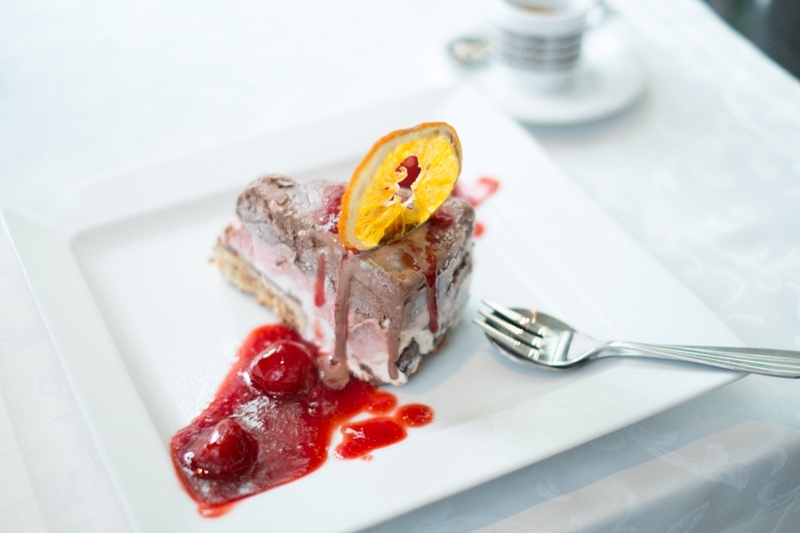 Don’t miss the opportunity to visit our wonderful Columbine restaurant! Business lunch – 20% discount (from 12:00–15:00)! Restaurant Da Antonio, located in Pulkveža Brieža Str. 11, Riga was opened in spring of 2005. In the splendid restored in Jugend style building of the hotel "Domina Inn Riga" refined Italian restaurant – the right place. Classic interior of the restaurant compose a rich red walls in one room and beige colored in the second. With taste designed covered tables and chairs, decorations on the walls and elegant curtains, together creates a sense of enveloping comfort. The interior is also supplemented by paintings and tapestries. Quiet music and a cozy interior – all together creates a feeling of warmth and relaxation. Here, as in all restaurants of "Da Antonio" you can find a wide selection of Italian dishes and wines. But the pizza you will not find. There are 60 seats in the restaurant. In summer an outdoor cafe is fitted. De Commerce Gastro Pub 1871, the signature restaurant of “SemaraH Hotel Metropole” delights with a pub-restaurant dining menu at its finest, impeccably mixed classic cocktails and signature creations, local craft beer, along with an eclectic by the glass wine list representing some of the finest producers in the world. Following the latest culinary trends in the world of gastronomy, “De Commerce Gastro Pub 1871” offers its guests an innovative approach to the traditional pub-restaurant dining experience with meticulous attention to flavours, ingredients, and presentation. Our award-winning Executive Chef and his team combine fresh and flavourful seasonal ingredients to create classically delicious dishes with an innovative twist. Delectable offerings include housemade pastas, fresh seafood favorites, expertly aged steaks, and an array of decadent, chef-inspired gourmet desserts awaits. Served in a stylishly decorated classic interior designed using fine woods, luxurious fabrics and finishes, complemented with relaxed seating and hospitable service. Select from our many fine wines to sip, or unwind with a handcrafted cocktail and indulge in the impeccable, award-winning cuisine of our top-rated Executive Chef Karlis Visockis while enjoying the sweeping panoramic views of the vibrant city centre. De Commerce Gastro Pub 1871 Bar, located within the restaurant is a comfortable, inviting space, complete with relaxed seating. Sample our creative approach to classic bar food while conversing with your spouse, friends or colleagues. The bar has its own separate menu, including many favorites, such as the famous SemaraH house burger, as well as house-made Pytt i Panna, Swedish meatballs, and shrimp sandwiches complement with a classic cocktail or signature creations, local craft beer, fine wine or sparkling wine by the glass from the carefully curated wine list featuring a variety of fine labels. Campaign, happy hour: Cocktails from 16:00–18:00, every day! Restaurant Domini Canes is located in a historically significant place on 18 Skārņu street, opposite St. Peter’s Church. You can people watch while sitting in the large window seats. In the summer, a spacious terrace is available for breakfast and dinner. The interior and menu are free of tasteless exaggerations. Peaceful background music and a modest menu. Prices here are even considered extremely low in comparison to standard prices in Old Town Riga. The leader among appetizers – smoked salmon tartar on golden potato pancakes along with fresh cucumber salad – 3.20 Ls. 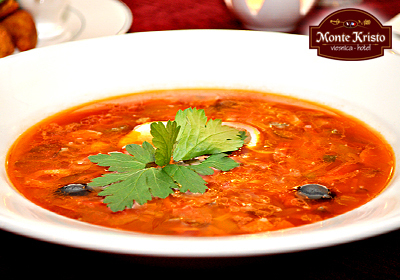 The soup menu includes goulash soup for 2.90 Ls or forest mushroom soup with smoked bacon for 2.97 Ls. The basic value of the second course lies in a serious approach to the size of a cut of meat and its preparation. Duck confit with butter fried vegetables and mashed cauliflower for 5.32 Ls will give you never-before experienced insight to the flavour possibilities of duck. 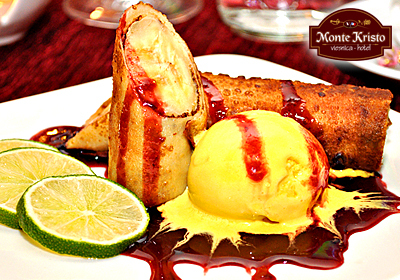 Definitely try the desserts – we have another surprise in store for you, but we won't reveal it quite yet. We also offer a wide choice of wines and cocktails and, of course, lunch hour specials on weekdays from 12:00–15:00 (20% discount on all meals) and afternoon happy hour from 16:00–18:00, when you can get two cocktails for the price of one. Easy Wine - New Riga’s bar with a unique approach to enjoying wine. The new Bar in Old Town offers residents of Riga and visitors a unique approach to the enjoyment of wine, which Latvia has not met before this. The Easy Wine guests can enjoy a wide selection of wines and other alcoholic beverages. The wines are being handled with the utmost care, ensuring all of them exactly the storage conditions under which our guests would receive maximum enjoyment. It is no secret that most of the wines should be served chilled - which is why they have historically been stored in wine cellars. Also, a wine bottle should not be kept open for long - for this reason, most of the good wines in restaurants are offered only in bottles, not poured by the glass. Easy Wine has solved both problems and can offer guests a glass of right temperature wine in in the perfect right conditions, without the need to buy a whole bottle at once. The technology that we use in the bar is ideal for wine and it allows visitors to try several kinds of precious drink in different amounts and choose the one that you liked most. There is also an opportunity to enjoy the process of wine tasting, choosing from 60 wines in a cozy atmosphere. Easy Wine - it's also a pleasant place for meetings and romantic dates. A variety of snacks, soups, salads, main dishes, and desserts complement the starters. The special atmosphere of the meal is not only accompanied by a comfortable interior, but pleasant music as well. For those who prefer the pleasure of enjoying wine at home - alone, with a loved one, or in good company - we offer to buy your favorite wine in to go as well! Easy Wine invites you to experience fascinating wine tour in the heart of Riga. 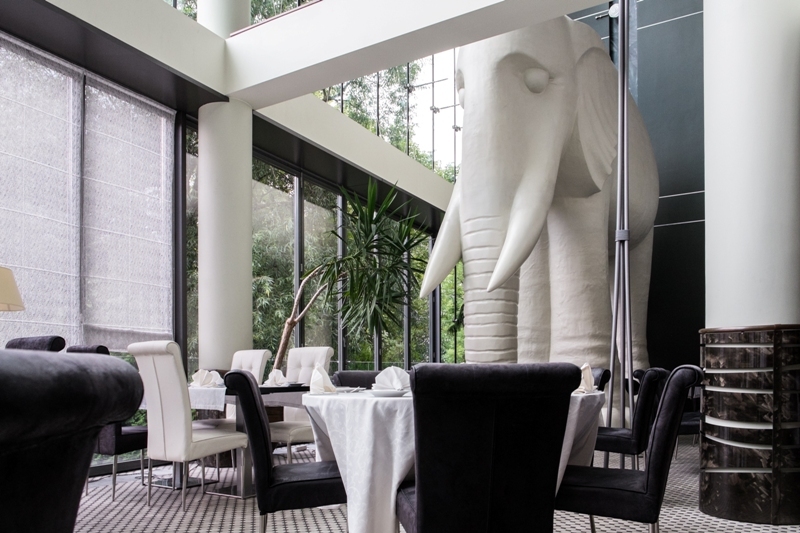 Airy and stylish Elefant restaurant and lobby bar is located on the first floor; white elephant statue comes first to sight and welcomes guests to enjoy a relaxing meal from our fine a la carte menu, which offers a wide range of European and traditional Latvian dishes. Restaurant is ready at your service daily from 11:00 am till 03:00 am - everyone has their own perfect meal time! D’vine is the first wine bar in Riga. Although the name accentuates the wine, not only the wine is offered here, since D’vine has become a bar-restaurant which is popular among wine lovers and gourmets. The atmosphere – cosmopolitan. Walls playfully combined with glass and metal, illuminated by refreshing and adjustable colour lighting are at the core of the modern interior of the bar. Elegant and beautiful. When sitting at the window, there is a feeling that you are a level above anything else happening outside. People rushing and cars driving past, but you are sitting and watching them peacefully with a glass of wine. At night the bar is illuminated by neon lights making it more appealing not only for those sitting inside, but also for passer-by. 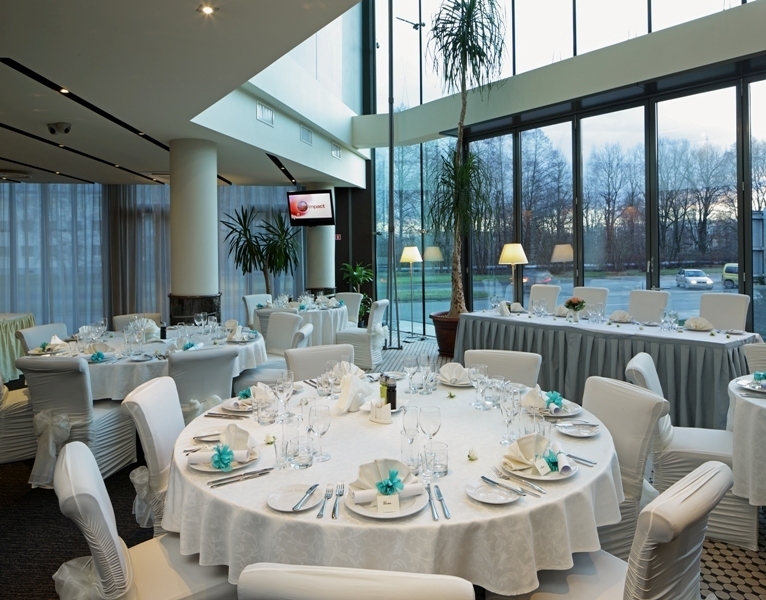 Restaurant Esplanāde offers one of the best international cuisine buffets in Riga, alongside it’s a`la carte menu. 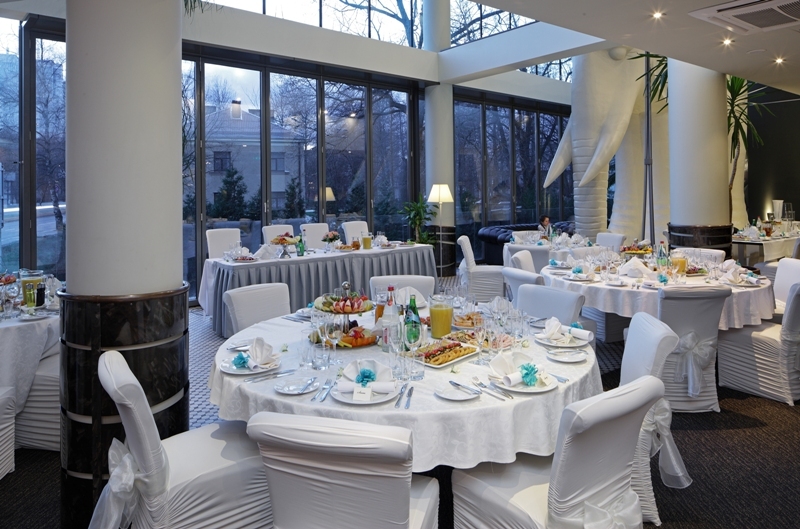 The famous breakfast and buffet lunch are served in bright, fresh surroundings, with a bright conservatory overlooking Esplanade Park in Riga. In the evenings, our international a`la carte menu uses local and seasonal produce to vary the range of hot and cold dishes. Mēs esam grauzdētava - zaļās kafijas pupiņas šeit pārtop izcilā, svaigi grauzdētā kafijā. Pie mums vari gan baudīt, gan iegādāties, gan izzināt to. Mēs esam kafejnīca - barista atklās Tev īpašas kafijas nianses un meistarīgi pagatavos gan cappuccino, gan Areopress. Mēs esam restorāns - šefpavārs Artūrs Taškāns ir ieguvis Michelin restorānu zvaigžņoto pieredzi, lai katra maltīte būtu neaizmirstama. Mēs esam cilvēki, kas mīl savu darbu un deg par to! There are 2 restaurants at the hotel. On the first floor – a romantic restaurant called Gutenbergs. 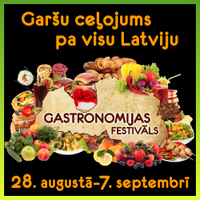 Classic Latvian and Baltic-German dishes, wide variety of world drinks. Good wine selection. Restaurant plays silent instrumental music and has a pleasant, cozy atmosphere. An open-air heated summer restaurant on the roof terrace of the 5th floor. Open May to September. Barbeque kitchen, a bar, live music. During business lunch we offer a special "stamp card", ij you are dining during the day offer and you order two or three day offer meals, you will get one stamp. Save six stamps and the seventh time the business lunch offer you will get free. During business lunch we offer juice for special price – 0.30 Ls! 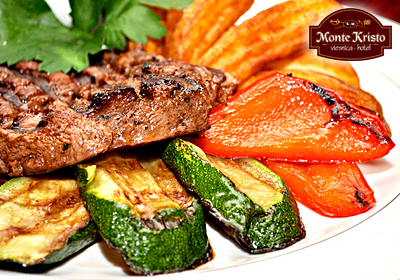 Order two beef steaks from restaurant menu and get Chile red wine bottle only for 0.01 Ls! Riga was an important member of the Hanseatic League which for several centuries ran the trading links across the Baltic Sea. In our restaurant Hanza Pub we offer delicious food and drinks from all of Riga’s former partners along the coast. You will not only think of Riga here, but also of Lübeck, Gdansk and Tallinn. Fresh fruit, vegetables and green salads all bought in the nearby Central Market are our guarantee of healthy food served through the day from breakfast till night. Restaurant on the 1st floor is suitable for breakfast, conference lunch and dinner, corporate events and banquets. 9th floor restaurant offers lunch and dinner with a brilliant atmosphere and a pictursque panoramic view of Old Riga. We offer lunch, dinner, as well as corporate events and banquets. We invite you to hide from the noisy city and enjoy our restaurant’s meals in fresh air with a unique view to the Old Riga. Kaļķu Vārti — Restaurant — the initiator of Contemporary Latvian Cuisine. The Chef Raimonds Zommers menus are characterised by modernity and seasonality. Dishes are prepared from local forest gifts and farm production, while the interior of the restaurant is dominated by modern ethnographic patterns. Kolonāde is our story about each other or Latvians. About what is important to us, beloved, once expected or happened. About what is now or will be. And we have a lot of – rain and sun behind a window, unique values – the Freedom Monument, the famous dating place “Laima”, the Old Riga with streets polished and whispered through many years, dreams, memories, longings and of course, meals. All that is felt in almost unobtrusive manner but in a close and perceptible story that we express through modern Latvian menu by Māris Jansons, a chef recognized in Latvia, a video stand, every material which is used in interior and with every though which is contributed by out entrepreneur, craftsman, artist or just Latvian. Come and take this story you too! You could not ask for a more perfect location. Housed in an historic building surrounded by columns, Kolonade. Our stories... offers postcard quality views of the Freedom Monument and Laima Clock as well as the National Opera and gardens. The menu, which provides colourful photos of each dish, specialises in gourmet Latvian and international coisine, which are prepared in open plan kichen by teh entrance. An early breakfast is also available not to mention Latvian beer, cider and an extensive drinks list that places an emphasis on Italian wines. (soup, main course with dressing, drink, bread)! (meal, drink, LIDO attraction, present)! The LIDO Recreation Centre in Krasta street 76, Riga, was opened at the end of 1999. It is a part of the LIDO enterprise network owned by Gunārs Ķirsons. The network consists of 10 bistros and the LIDO Recreation Centre which has, in some respect, become a visiting card of Riga and Latvia. It is one of the most attractive public catering enterprises in the world and one of the most favorite places of family recreation in Riga. The Centre is characterized by a Latvian environment, tasty and various dishes, LIDO beer, live music every evening, and celebration of national festivities with gorgeous decorations and concerts! The main building of the LIDO Recreation Centre is one of the biggest and most beautiful log buildings in Europe, which can host 1000 guests. The building has been constructed of specially selected, more than 100 years old Latvian fir-trees. The territory of the Centre with the spacious catering complex, parking lot for visitors and the Amusement Park is carefully greened and decorated, and it occupies almost 5 hectares. Decorations and ornamental plants are changed according to seasons. The LIDO Recreation Centre is attended by more than 150,000 guests per month, and their successful reception is ensured by approximately 350 employees. The LIDO Recreation Centre offers a rich menu consisting both of national dishes cooked according to ancient Latvian recipes, and dishes of other nationalities. The chosen dish is cooked by skilful LIDO cooks just in front of you. In the basement of the Centre – Beer Cellar – you are welcome to enjoy national food, listen to cheerful music and also dance. Every day You can watch the sport games of Viasat sports program on big screen. The Bistro on the first floor of the Centre offers almost 500 different meat and fish dishes, pasta, pancakes and freshly squeezed juices. The Restaurant located on the second floor of the Centre offers a wide choice of a cold buffet, as well as hot dishes specially cooked to each guest’s order. The quiet atmosphere of the restaurant, kind and individual service will help you relax. The pride of the LIDO Recreation Centre is the restaurant-type mini-brewery, which is the first of its kind in Latvia. Three types of live beer: LIDO Light, LIDO Special and LIDO Honey are brewed simultaneously there. Any visitor is welcome to watch the brewing process. Pastry shop – LIDO professional pastry-cooks will delight your heart and stomach with fresh buns, biscuits, cakes, and other sweets. You can try them in the pastry shop or take them away. Children will really enjoy various chocolates and chocolate figures. Banquets – celebrations in the premises of the LIDO Recreation Centre up to 1000 persons, laying the Tables in Your selected premises, outside catering of groups up to 5000 persons for several days. Depend on season the Park offers more than 20 different attractions both for children and adults: Tower, Sky dive, Cannon Room, Car Rental, Hippodrome, Shooting-ground, Children’s Town, and Children’s Driving School, Sky Glider and Skating-rink, which is the largest ice-rink in the Baltic States during the winter. Its capacity is 400 people. It covers 5102 m2 large area. Playroom – for children to enjoy and for parents to feel free! For everyone to take a rest, for parents to forget the daily care, children are invited to spend time joyful in LIDO Playroom. There is an unprecedented possibility to meet new friends, play together in colourful bolls, slide down form sliding hills, draw, glue and put together puzzles. LIDO staff will take care for your child. Celebrations of Christmas, the New Year’s Eve, Midsummer Night and national holidays are always special at the LIDO Recreation Centre. Both children and adults can enjoy the magnificent decorations, specially made for each celebration, as well as thematic events and concerts. In the Restaurant and Beer Cellar live music every evening. “Locale” itāļu valodā nozīmē “vietējais”. Šajā nosaukumā ielikta dziļa un rūpīgi pārdomāta filozofija. “Locale” piedāvā pašu labāko no Latvijas dabas, agrāko no vietējām siltumnīcām un izcilāko no vietējām saimniecībām. Šefpavārs Andrea Bressans radījis latviešu virtuves versiju, kas, lai gan tradīciju gara piesātināta, tomēr spētu sagādāt prieku jebkuram mūsu planētas iedzīvotājam. Tā ir latviešu produktu un Vidusjūras virtuves sinerģija. Restorāna „Locale” ēdienkartei vērts sekot īpaši vērīgi – tā veidota uz patiesas sezonalitātes pamatiem un tātad ir mainīga kā pati daba. Sezonalitāte – tā ir produktu pašizpausmes kulminācija, kad paši parastākie no tiem spēj atklāties jaunā gaismā. Tā ir vispārzināma patiesība, ka absolūta vienkāršība ļauj sasniegt pilnību. Taču tik un tā grūti nebrīnīties: kā gan kaut kam tik ikdienišķam var piemist tik piesātināta garša? Sezonalitātes princips attiecas arī uz restorāna kokteiļu karti, kurā līdztekus sen pārbaudītai klasikai iekļauti arī oriģināli kokteiļi un pašu gatavotas limonādes no vietējiem augļiem, ogām un augiem, kā arī dabiskajiem sīrupiem. Hotels Grill & Bar Mazais Otto is an ideal place to meet friends, withholding a leisurely breakfast, business lunch or enjoy a great evening town atmosphere. Bar terrace is located on Kaļķu Street and allows you to experience the city early morning, active atmosphere and the magic of the evening, especially in the warmer months. At your disposal in our delicacies and all Riga entertainments on offer. For you to be daunted by Latvian changing weather conditions, hotel terrace is equipped with parasols and radiant heaters. The terrace is open from May to October. Grill & Bar menu features grilled food for both meat-eaters and vegetarians, salads, hot and cold snacks, as well as a range of drinks. Weekdays also offer a business lunch. Booking in advance - 10% off! Our name speaks for itself. Black Cat House Restaurant is a favorite place for those who ten years ago in the Black Cats in the evenings playing billiards, but now have grown up, and their requirements become more selective. Beer mugs will either be replaced with a glass of good wine, fast food with fresh salad, delicious soup or main course. Much attention is paid to the restaurant's kitchen and the bar is set high - visitors are offered only to high-quality food from specially selected fresh local products. The new restaurant specializing in home tasteful cuisine with a Latvian flavor, it reminds us of home and a sense of coziness, when a loving hand brewed just for you by delicious. Edgar Beitans restaurant owner and chef Andrew Kudravecs has put a lot of effort to the new cat would be even better and friendlier than the old, so many popular holiday destinations, but now another quality. Find us on the Old Town, the Master Street 10/12. Our hotel has a nice summer terrace where you can feel in romance and piecefull atmosphere. Guests can have dinner or supper outside and try waterpipe. The strength of Muusu restaurant is in the tandem of chefs Ainārs Volodka and Kaspars Jansons. We dare to say: this is one of the best chef duets in the city, which has gained its experience in many places, including in the legendary Noma in Copenhagen, one of the coolest restaurants in the world. The ascetic tableware of Muusu, made in the Rauna brick-kiln, is like a canvas for them to paint on. The menu is based on stable culinary values; the classics of modern Europe, where space is left for bright interpretation and seasonal accents, while simultaneously paying respect to everything fresh and of local origin. NB Hotel Restaurant is Riga's best kept secert, that offers European cuisine eith wide range of dishes for every taste. Restaurant is welcoming those who appreciates exceptional service and cozy atmosphere, where you can slowly enjoy delicious food alone or together with your friend or colleagues drinking tasty coffe or glass of wine. NB Hotel Restaurant is a great venue for wedding celebration, anniversry party or large-scale corporate events organizing. The total event capacity is up to 150 guests. For the event we offer customized menu and we strive to provide best service and quality to make each celebration unique and special. Restaurant Neiburgs, housed in a historical Art Nouveau building, is popular among visitors and locals who love a good dinner out. Its success is based on the combination of historical and stylish elements in the restaurant’s decor and menu. The interior features lots of light and lightness; the fare is a fusion of contemporary trends and tradition for a reasonable price; the mood is set by background music soft enough not to make listening to your table-mate a hard task. The restaurant is famous for its hearty business lunch menus and excellent steaks, burgers and soups. Campaign, happy hour: Cocktail special offers 16:00–18:00! Small and cozy Old Riga Palace restaurant/bar is located in Wellton Old Riga Palace Hotel and hidden from city hustle and bustle in the quiet Old Riga center. Bar/restaurant is opened daily from 12:30 p.m. - till 00:30 a.m. and offers European and traditional Latvian cuisine, as well as a wide selection of alcoholic and soft drinks. You will feel definitely surprised about pleasant prices and cozy atmosphere. The restaurant has references to the film based on "The Godfather", the famous novel of Mario Puzo. The name of the restaurant is coming from the film too. The restaurant is divided into three relatively separate parts, each of them decorated in a different style. There is a Venice room with a six-seat table, a hall designed according to Sicilian tradition, and Sala Verde with a bar and checked table clothes. The warmth of interior painting together with antique breathing of a house in the Old Town of Riga creates a veritably homey atmosphere filling you up with agreeable peace and anticipation of a meal. And you will not be disappointed for the time spent in anticipation. The food is indeed that of the highest quality, with refined and balanced taste. Moreover, the prices are very reasonable. They have a thoroughly thought-out menu — classic, yet interesting, a menu where everyone, be it a vegetarian or a taste aesthete, can find his or her favourite dish. Seafood soups, pastas made at the restaurant, pizzas, brusquettas, traditional Italian snacks, meat and fish dishes are available there. 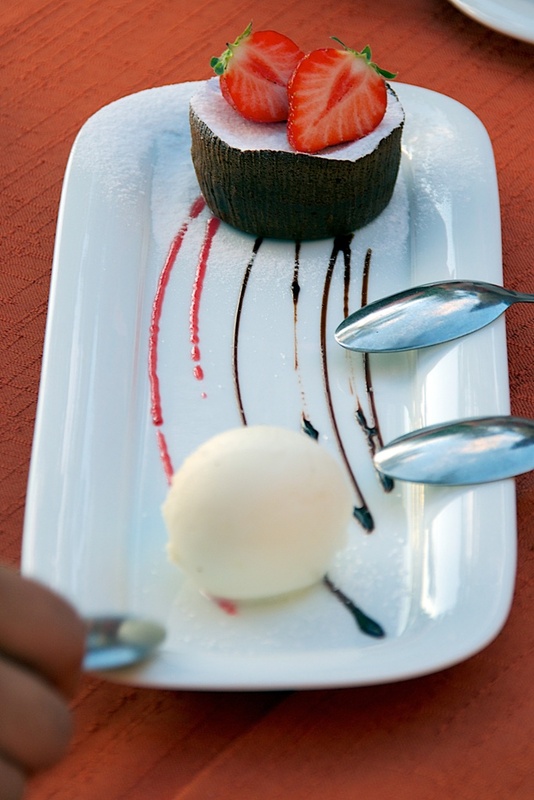 And the dessert, of course, is an Italian classics — Tiramisu, Panna Cotta and other delights depending on the season. While you are waiting for your ordered meal, a waiter serves freshly baked bread with olives in a small basket. Italian restaurant "Olive Oil Trading Co." is one of the best combinations of location, interior, cuisine, and price that you will find in Riga. It can be most conveniently reached on foot. Price level: meal for one person EUR 8-30.